Since festooning the streets of Bath in colourful crochet for the Bath in Fashion 2016 yarn bomb I have been busy creating my most colourful creations yet! Juggling my time between teaching classes in the art of mosaic and crochet (although not together!) and designing some exciting crochet projects for Rico Design I have been beavering away in my studio, knee deep in wool making pom poms and mandalas for some very special bikes! These 3 bikes have been commissioned by Bath Council as part of the cities celebration at hosting the finale of the 5th stage of the Tour of Britain which arrives in Bath on 8th September. Blink and you will miss it as I hear they pedal at some speed....although riding this tricycle could prove tricky. The wonderful thing about this project for me, as an artist, has been knowing the finished work is to be displayed in a shop window protected from the elements. This has given me a wider freedom to work an installation that has fewer creative restrictions than those displayed outdoors in public spaces. It's essential to have the bike in front of me when I'm working as each piece is made to measure. The wheels need to be removed from the bike in order to attach the mandalas to each side. Starting with the wheels was key in laying out the design for the whole bike and both sides of the wheels need to be done to ensure a snug fit as well as make it visible from both sides. Starting with the design for the wheel mandalas was key in determining the design for each bike. The wheels were the most time consuming part as I chose to work both sides to ensure a snug fit and to allow them to be viewed from both sides. Having bikes in my living room became part of daily life and once the wheels were covered and reattached moving the bikes became harder as the wheels no longer turn. Of course the best place to complete any work of art is on the table in my studio!!! I wanted to create a joyous 'Rio Carnival in wool' and so I’ve gone all out with the colour and pompoms. I couldn’t resist adding the flowers to the principle bike taking it into the world of circus which just felt the natural way to go. The principle bike is designed to be viewed from both sides with each side giving it's own unique look. It wasn't possible for me to work 3 bikes all on my own as my little fingers just couldn't work fast enough. 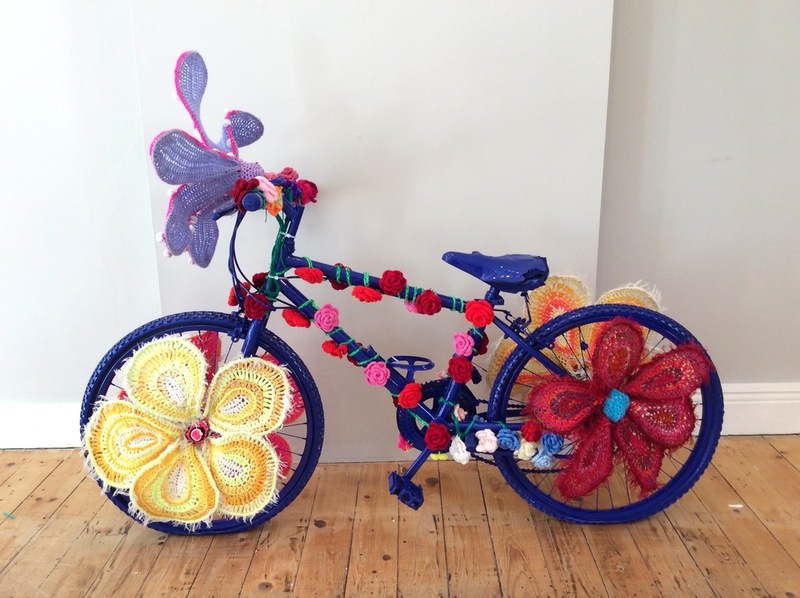 Luckily my wonderful friend and fellow yarn bomber Rosie Wilks was on hand and what a beautiful bike she has made! 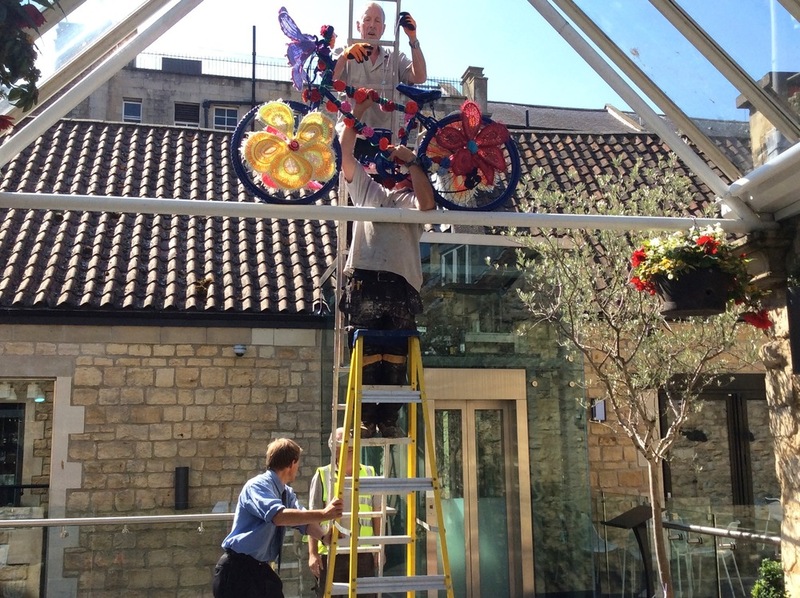 The Lovely people of Milsom Place asked me (very last minute) if I could do a bike for them too.....how could I say no?! Luckily I was able to use the remainder of my wired flowers and it's great to see it on display! It's been a happy and playful project to work on and I am really looking forward to seeing how Bath responds with their own decorated bikes for the Bath Bike Trial.